Banana Republic is getting a chromatic makeover. On Thursday, Banana Republic's Flagship store opened in Manhattan on Fifth Avenue, with both a men and women's section in the two-floor 27,892-square-foot megastore, according to WWD. This new location will replace the two separate men and women's stores taking residence on Fifth Avenue. Growing up, I knew Banana Republic as a "working clothes" store where my older brother and sister would shop for pinstripe trousers (yikes) and blazers, along with other work staples like stiff button-ups and striped ties. And for years, it represented the corporate world to me. Until Marissa Webb entered the picture. 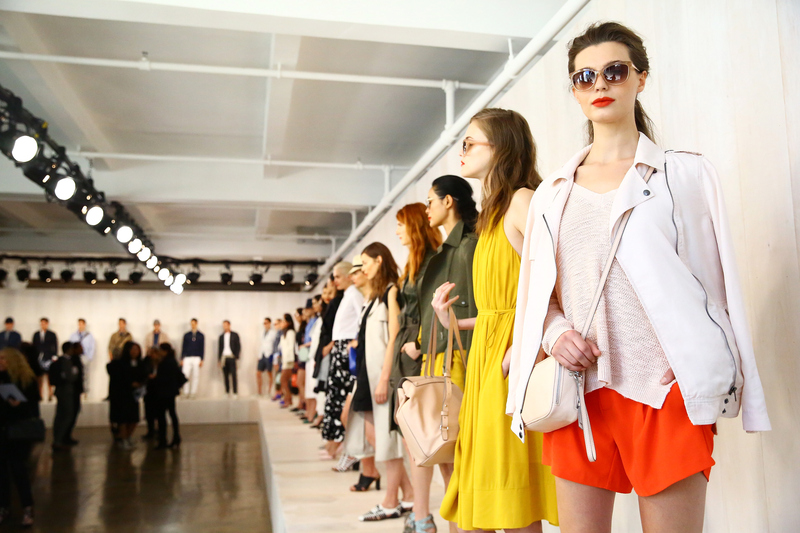 I first saw one of Marissa Webb's shows in 2013, during her F/W presentation at New York Fashion Week. I instantly fell in love with her borrowed-from-the-boys aesthetic, and I think I may have actually gasped when I saw her burgundy leather skinny pant. And when I heard that she would take the title of Creative Director of Banana Republic, I was ecstatic. Just when I was beginning to enter the work force. The fashion gods were looking out for me. In this new collection, displayed in the flagship store, you can find a more casual-corporate look, which follows the trend of 7 day dressing, blending weekend and work week styles together. And while BR's old palettes consisted of neutrals—blacks, whites, grays, and nudes—the brand has shifted to a more colorful aesthetic, with oranges, yellows, and teals. While the flagship store covers a whole lot of real estate, the shop is set up boutique style, with different sections having their own personalities, according to WWD. To make the shop warmer and more approachable, home decor from Izola is displayed, as well as other items from artisan brands. Slogans like "I'm OK with my crazy" are emblazoned on the walls—a true shift from BR's old aesthetic.